Once you have decided to vacation in the Florida Keys, the first and most important task is the selection of a place to stay. There are almost as many types of accommodations in the Florida Keys as there are types of visitors who travel here. Each group of this string of islands running from Key Largo through Islamorada, Marathon, and Big Pine to Key West, offers a particular type of activity and attracts visitors for a specific kind of vacation. And each has the perfect place for you. Some visitors come for the fishing; others to view the many historical sites; some for the diving; others to enjoy the nightlife; some just to â€œget away from it all.â€ Many bring their children and want family-type accommodations; some even bring their pets and seek a pet friendly place to stay. From large high end luxury hotels and resorts with amenities galore to less expensive hotels and motels to small cottages to bed and breakfasts to campgrounds â€“ the Florida Keys have them all. Click the link to the location you prefer, click on Accommodations, then click on the type of accommodations you seek; youâ€™re sure to find the information you need to make your stay in the Florida Keys as exciting or as relaxing as you want. 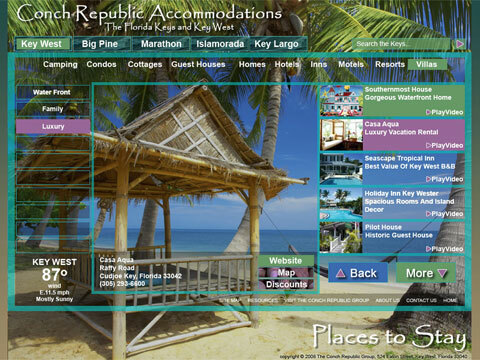 There is an abunadnce of travel information available in ConchRepublicAccommodations.com so sit back and take an online vacation in The Florida Keys right from your computer. Conch Republic Accommodations is committed to promoting tourism and quality services in The Florida Keys and Key West by creating high definition vacation videos that steam on the internet. In entertaining short video episodes, Conch Republic Accommodations shows you the newest and most exclusive travel vacation destinations that The Florida Keys Key West have to offer, always free and on demand. Our expert video travel hosts take you behind the scenes for a look into The Conch Republic lifestyle and the diverse Florida Keys and Keys West people who define it. Don't forget to log in to www.KeysTV.com every day and stay up-to-date on our most recent Florida Keys and Key West video segments and video news programs. All Florida Keys and Key West video programming is thoroughly scouted to ensure that KeysTV brings you only the finest videos about destinations, products, services and trends. Join us for an enjoyable and inforamtive online vacation from Conch Republic Accommodations! The Florida Keys and Key West, we're flip flop friendly!